It's A Family Adventure! : A Splashing Time at Alpamare Waterpark! A Splashing Time at Alpamare Waterpark! Following our week in Somerset, we ventured to the North Yorkshire coast for a couple of days of camping. This is an area we haven't visited before, and so we were keen to find some fun things to do in the area. 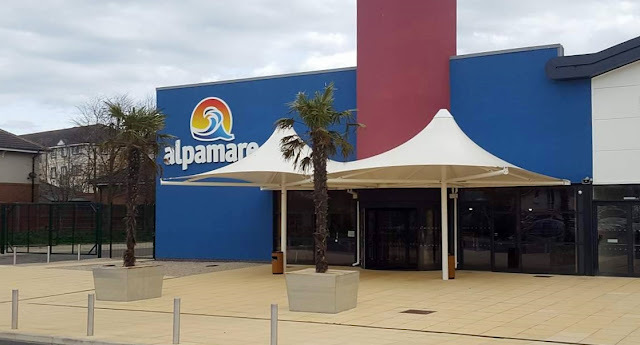 Whilst doing some research online, I came across the Alpamare Water Park located in Scarborough, and the website pictures looked extremely impressive. The attraction is less than a year old, and I knew that it was somewhere we definitely had to visit. We chose a cloudy overcast day to visit and I had hidden the fact that we were going to a water park from the kids, and instead simply told them that we were going swimming. Some of the slides looked similar to what we had experienced in Florida last year, and so I knew that the kids would absolutely love it! As we pulled into the large car park which can accommodate up to 300 vehicles, the slides were immediately noticeable, and Emma and Ben's faces lit up with excitement. They couldn't believe their eyes as they stared at the huge colourful slide tower in front of them, and quickly ran towards the entrance. First impressions of the outside of the water park were that the car park was very clean and spacious, and the building was very bright and eye catching. We couldn't wait to enter and see what was inside. As we entered the main reception area, we received a friendly greeting, and the receptionist explained about the electronic wristbands that we would be required to wear during our visit. These wristbands record the time of arrival and departure, provide access to the lockers, and also allow you to charge food and drink to an account that you settle when you leave. We loved this modern idea and the cashless system seemed a great convenience to have. As we entered the changing rooms, I was pleased to see how clean the whole area was, the cubicles, toilets and showers were all spotless, which is very surprising given the amount of people who must use the facility. Cleanliness and maintenance is very clearly important to Alpamare Water Park and their excellent standards were easy to see. The lockers were a very nice size, and we ended up using three between the five of us. It made a nice change to not have to search for some pound coins to use them, and the kids enjoyed being able to use their wristbands to open and lock them. Once we were changed, we made our way to the pool area. I was very surprised on entering just how spacious it felt, and despite being busy, it didn't feel crowded at all. There were sun loungers situated around the outside of the pools, and we saw the nicely presented restaurant to the left of us. Emma and Ben immediately made their way towards the slides with their dad, whilst Riley and I began to enjoy the Splash and Play area. It wasn't long before we were soaked, as somehow I had failed to spot the giant tipping bucket filling up over our heads, and so as we made our way over to the steps, the bucket tipped all over us, resulting in hysterical laughing from Riley as he looked at my shocked and wet face! I glanced over to the slides area, where I saw Mr F, Emma and Ben all carrying a very large rubber ring that could seat four people, and realised that they had chosen to ride on 'Snow Storm'. The other rides were called 'Black Run', 'Olympic Run' and 'Cresta Run'. Each slide had their own age and height limits so it is an idea to check this before visiting to make sure that your children are old enough and tall enough to ride, to help avoid any disappointment. Luckily Emma and Ben were able to ride on them all, and they had an absolutely fantastic time. Emma said it felt like we were abroad in a posh resort, and although it is true we have visited many waterparks overseas before, this was definitely the most modern and clean. The Splash and Play area where Riley and I stayed was great fun, and there were lots of water play activities for Riley to enjoy. There were steering wheels on the steps and platform leading up to the small toddler slides that could control the water fountains and there were handles and wheels on a large structure of tubes, funnels and paddles. These could also be controlled by the children and Riley really liked being able to squirt water at me. About half an hour into our visit, both Emma and Ben came over to say that the wave pool was about to start and so we headed over to the main pool area to wait for the waves. Emma and Ben enjoyed jumping and swimming amongst the high ones, and Riley and I sat on the edge of the water so that we only had the little waves to deal with and Riley could jump over them and splash. When the wave pool had finished we enjoyed a little swim, until Mr F came over and suggested that we went in the outdoor pool. I immediately said no as surely it would be freezing outside, but Mr F told me to trust him, and we made our way down several steps and through a partition into the outdoor pool. We were all extremely happy to find that this was a really warm pool which is heated at 35 degrees celsius. It also had a beautiful back drop looking out towards the coast, and it was like being in a giant hot tub. We managed about twenty minutes out here, before the kids decided that they wanted to venture back on to the slides. I could have happily stayed there for hours though! In addition to this, there was a further outdoor pool, called the infinity pool which again had sun loungers placed around the outside, and I can imagine this being absolutely lovely in the summer months. I later found out that this pool also contains healing iodine water. When we returned back inside, Emma and Ben went to the slides again, and Riley decided that he was going to brave the smaller slides in the Splash and Play area. He had been unsure of this to begin with, but after watching several other children go down safely he nervously took his turn. He let out a high pitched scream as he went down the slide and splashed into the water, quickly followed by the words "Again, again". In total we spent just under three hours in Alpamare, and the time literally flew. If we lived in the Yorkshire area, it would certainly be somewhere that we would visit regularly, and I think it is an ideal place to visit with the kids after school. Just before we left I took a quick look at the restaurant area which serves a range of both fresh and healthy choices including salads, pasta and pizzas. Hot and cold drinks are also available to purchase. The benefit of the cashless wrist band system also means that there is no need to return back to your lockers or get notes wet in the process which is a fabulous idea. 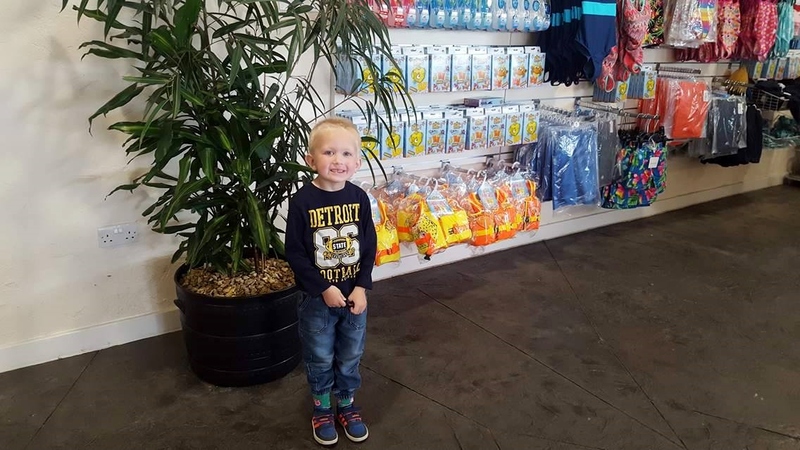 In the reception area there was also a shop which sold a wide range of swimming related items, so if you have come on holiday without your swimming costume, or you have accidentally left your childs armbands at home, then don't worry as these can be purchased here. 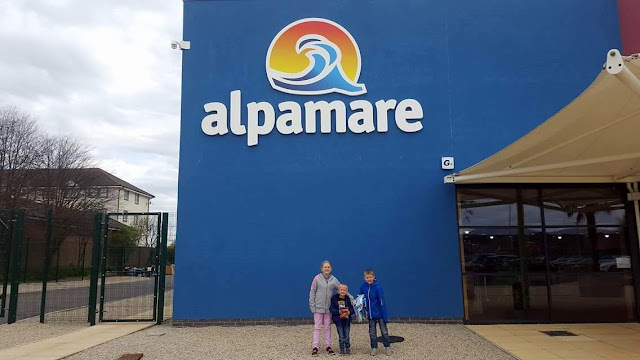 Overall we had an absolutely fantastic time, and the next time we are visiting the Yorkshire area, we will most definitely be visiting Alpamare again. In terms of cleanliness and modern facilities, this water park has set its standards extremely high, and the pools and slides were absolutely excellent. We would definitely recommend to other families looking for a fun day out. 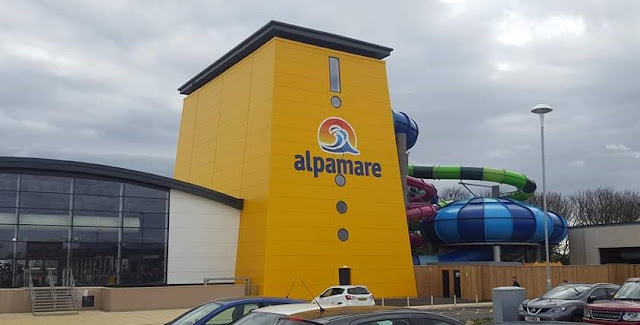 Opening times: Alpamare Scarborough is open 365 days a year between 10am til 10pm Monday to Saturday, and 10am til 9pm on a Sunday. It is located at North Bay, 28 Burniston Road, Scarborough, North Yorkshire, YO12 6PH. *Disclaimer: We were provided with complimentary admission for the purpose of providing an honest review of the attraction. All opinions and photographs are my own unless otherwise stated. Entry prices and opening times are correct at time of writing, however I would always recommend checking directly with the attraction for the most up to date information.